Within this context, King began to publicly articulate an anticapitalist analysis of the United States that put him in sync with rising critiques from the global revolutionary left of market-based economies. Despite the “affluence” of the United States, it was, nevertheless, wracked by poverty and entrenched in an endless war. King masterfully tore down the wall that the political and economic establishments used to separate domestic policies from foreign policies. He debunked the lie at the core of the Johnson administration that they could deliver both guns and butter, and he pointed out how the Vietnam War made it impossible to satisfy the deep need that existed on the home front. Moreover, any society invested in the evisceration of the Vietnamese people could not truly be a society committed to developing the human potential of its own people. He was cut down before he could see the fulfillment of his new strategy in Memphis or in Washington, D.C., and the “interrelated flaws” of U.S. society have only intensified in the fifty years since King first invoked them. Indeed, the conditions warranting class struggle have become worse as the wealth within U.S. society has continued to accrue at the top. Yet King’s ability to name the elemental human suffering that is produced by our profit system, while simultaneously demonstrating the centrality of the black movement in unraveling its internal and external logic, remains a powerful political tool. 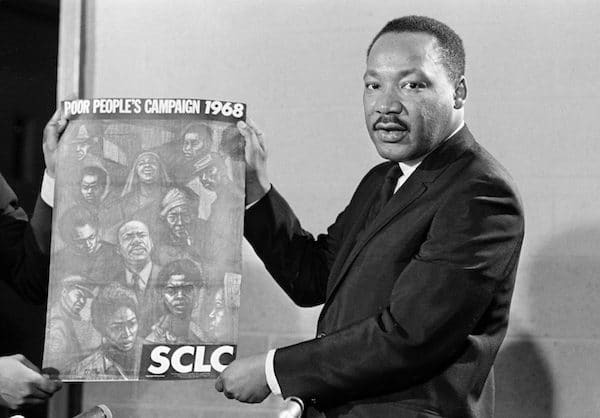 This anniversary offers new opportunities to engage King’s political thought, including his anticapitalism and his repeated call for larger and deeper political struggle. Excerpted with permission from the forthcoming book Fifty Years Since MLK, edited by Brandon Terry. Keeanga-Yamahtta Taylor, assistant professor in African American Studies at Princeton, is author of From #BlackLivesMatter to Black Liberation.